Overall conceptual plan for Tsuut’ina First Nation development. Major economic development on Tsuut’ina First Nation means a future for members on the southern reserve. “This opens up a lot of opportunities for the young people,” said Councillor Emil Starlight. On Monday, the First Nation announced a partnership with the Montreal-headquartered development company Canderel in a multi-billion dollar three-part major commercial development. 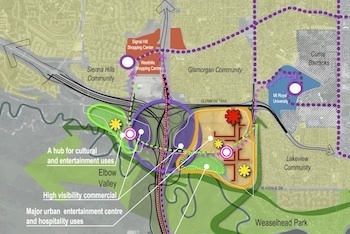 The development of the lands that will abut the city of Calgary in the southwest along the ring road will begin in the next two or three years. Tsuut'ina Park, about 500 acres, will focus on entertainment and hospitality, complementing the success of the Grey Eagle Resort and Casino, as well as creating high-value retail opportunities. Tsuut'ina Crossing is 360 acres and will accommodate a major innovation and research campus built in a park-like setting with access to trails, parks, and open spaces. An integrated health and wellness area will include supporting retail, office, and mixed-use developments. Tsuut'ina Centre is 380 acres with a major regional retail and commercial centre integrated with the administrative and community services of the Tsuut'ina Nation. All construction work will include a percentage of jobs going to Tsuut’ina Nation members, as will service jobs. But members’ involvement will go beyond that, says Starlight. “One of the things we’re trying to get the Nation members to look at is becoming franchise owners themselves,” he said. Some sort of development along Calgary’s new ring road has been in the works since 2008 or so, says Starlight. Chief and council developed the plans and consulted with a number of firms across Canada. Council was impressed with Canderel’s multi-faceted developments in Toronto and Montreal, says Starlight, noting that Canderel was one of seven firms shortlisted. Canderel was one of seven firms shortlisted, he adds. “You hear about historical moments in history books and television and whatnot, but to actually realize you’re actually in it and living it in that historical moment, it’s surreal. It’s huge and exciting,” said Starlight. Whitney said the development, which will bring financial benefits through rents and property taxes, is one of the largest for a First Nation. “The real motivation,” said Whitney in a statement, “is to create opportunity and allow future generations to work and flourish right here, at home. Generations of Tsuut'ina people will also be able to receive services, to shop, to learn, to invest their money, time and skill, to apply their trades, and to develop a profession – all while being near their families and their extended Nation family. At home. At Tsuut'ina." The southwest portion of the ring road is scheduled to be completed in 2021.